In the timeline of rock the chance meeting fifty years ago today between childhood friends Mick Jagger and Keith Richards, and guitarist Brian Jones at an Alexis Korner concert in London, set the stage for the longest continuous rock act in history — The Rolling Stones. Brian Jones was the initial leader but by 1969, with Jones’ personal life unraveling under the weight of legal and drug problems, Richards and Jagger took over primary control of the band. Brian Jones left the Stones in 1969. Publicly it appeared to be his decision but legal problems and drug issues surrounding the co-founder had become very divisive and on June 8th of ’69, Jagger, Richards, and Watts, met with Jones to let him know the band would be moving on without him. Jones was replaced by 20-year-old guitarist Mick Taylor (formerly of John Mayall’s Bluesbreakers). Charlie Watts took over drums in January of ’63. Bill Wyman replaced Taylor at Bass in December of ’62 but retired in January of ’93. Mick Taylor left the band voluntarily in 1964. He was replaced by former Birds / Faces guitarist Ronnie Wood. Ian Stewart played piano off and on, and acted as road manager from the beginning until August of 1985. “Stu” had a heart attack that December and died in the waiting room. Chuck Leavell, long time Allman Brothers’ piano player, stepped in as the unoffical Stones keyboardist in the wake of Stewart’s death. After Wyman retired, Darryl Jones, a noted sessions musician from Chicago was invited to play bass, a position he enjoys today. Considering the recent tift between Jagger and Richards another tour is questionable. With Jagger and Richards both enjoying a young 68-years-old, if they have one more tour in them they’d better get going. There’s just something about the prospects of 70-year-old rockers playing Carnegie Hall that doesn’t seem quite right. Rolling Stone magazine is saying a Stones Tour for 2013 is being tentatively planned but everything hinges on Richards’ health. I wonder what this Tour would be named??? This entry was posted in Music, Rock and Roll Saturdays, Slider and tagged Charlie Watts, Chuck Leavell, Ian Stewart, Keith Richards, Mick Jagger, Music, postaday2012, Rock and Roll Saturdays, Ronnie Wood, The Rolling Stones on April 7, 2012 by Mickey Mills. The Rolling Stones were formed in April of 1962 by twenty year-old Brian Jones, some say a musical genius way ahead of his time. Jones moved to London where he befriended fellow musicians Alexis Korner, future Manfred Mann singer Paul Jones, future Cream bassist Jack Bruce and others mingling around the London R&B and Jazz scene of the time. Jones, wanting to form his own band, placed an advertisement in the Jazz News calling for musician tryouts. Pianist Ian “Stu” Stewart was the first to sign up, followed quickly by singer Mick Jagger and his childhood friend Keith Richards as guitarist. Over the next several months drummers and bassists would come and go before finally settling on Bill Wyman and Charlie Watts. The Stones built their popularity in the U.K. music scene playing R&B covers in and out of pubs and nightclubs all around the city. In June the Stones traveled to the U.S. for their first appearance outside Europe. Bill Wyman dubbed it a disaster. “When we arrived, we didn’t have a hit record [there] or anything going for us.” When the band appeared on Dean Martin’s variety show The Hollywood Palace, Martin mocked both their hair and their performance. The highlight of the tour was a two day recording session at Chess Studios in Chicago, where the band met many of their most important influences, including Muddy Waters. 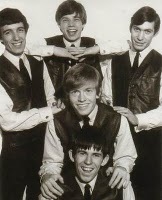 These sessions included what would become the Rolling Stones’ first number #1 hit in the UK: their cover of Bobby and Shirley Womack‘s “It’s All Over Now“. International recognition for Stones would arrive in the summer of ’65 with the colossal smash hit (I Can’t Get No) Satisfaction. The stage was set for a pop phenomenon that has endured. Brian Jones would mark his place in history by also being one of the earliest members of Club 27. He left the Rolling Stones in June 1969 to be replaced by guitarist Mick Taylor; Jones died less than a month later in his own swimming pool. The coroner’s report stated “death by misadventure”, and noted his liver and heart were heavily enlarged by drug and alcohol abuse. Where other rock stars have hung up their microphones and moved to the sidelines letting younger musicians fill their void, the Rolling Stones continue to make music. Jagger and Richards have written new material for an album, which they hope to release sometime in 2011. In August of 2005 the Stones set out on A Bigger Bang Tour, visiting North America, South America and East Asia. In February 2006, they played the half-time show of Super Bowl XL in Detroit, Michigan. By the end of 2005, the Bigger Bang tour set a record of $162 million in gross receipts, breaking the North American mark also set by the Rolling Stones 1994. 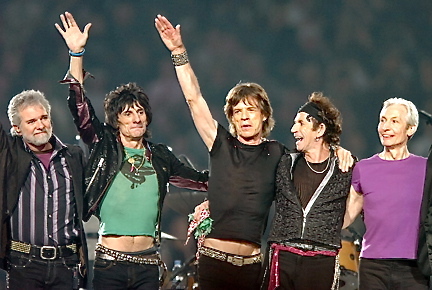 On 18 February 2006 the Stones played a free concert with a claimed 1.5 million attendance at the Copacabana beach in Rio de Janeiro. Mick Jagger was 62 years-old. Speaking of which — Mick celebrated his 68th birthday on July 26. He still gets his Ya-Yas out. Happy birthday Mick Jagger. May your next decade be as fruitful as the last. This entry was posted in Music, Rock and Roll Saturdays and tagged Brian Jones, Charlie Watts, Jeff Beck, Keith Richards, Mick Jagger, Mick Taylor, Peter Frampton, postaday2011, Rock and Roll Saturdays, Ronnie Wood, Rory Gallagher, Stu Stewart, The Rolling Stones on July 30, 2011 by Mickey Mills.